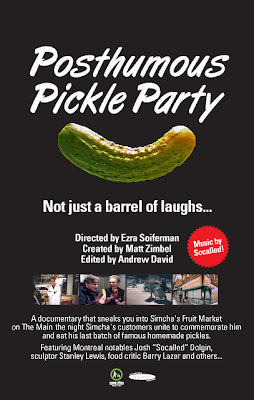 -Posthumous Pickle Party was created and co-produced by Matt Zimbel and filmed, directed and co-produced by Ezra Soiferman. Editing is by Andrew David and music is by Socalled. Additional footage by Socalled and Melissa Auf der Maur. -The film aired on Vision TV in Canada on August 29th 2012. Read a review in the CJN here. Globe and Mail review here. -The film was written up on February 21st, 2007 by columnist Bill Brownstein in the Montreal Gazette. Read it here. -The film first played at Film Pop (part of Pop Montreal) on October 7th, 2006. The show was sold out (sorry to those who couldn't get in) and pickles were distributed afterwards. Read one fan's review. -The film screened Thursday, Feb 22nd to a sold out crowd at Montreal's NFB Cinema as part of the Rendez-Vous du Cinema Quebecois film fest. Pickles were served again afterwards. -The film has been profiled on Global-TV, CBC-Radio, CBC-TV, The Gazette, The Canadian Jewish News, The Montreal Mirror, Hollywood Reporter, Variety, Radio Centre-Ville and beyond. Thank you to all members of the media who helped spread the word. -The film was selected as one of the best docs at the Rendez-Vous film fest in the May 18th, 2007 issue of 24 Images magazine. -Canal D, the French-language documentary broadcaster, showed the French version of the film on Sunday, December 16th, 2007 (9pm) and Thursday, December 20th (1pm). Thanks to all who watched! -The film won the Ville de Montréal Prize at the closing ceremony of Eurofest 2008 at Cinema du Parc. More info. -The DVD is available through Perpetuum Productions. Email Ezra at: ezrasoif at gmail dot com to order a copy. Thanks for all your interest in the movie as it was being made. Thanks to all who have packed the screenings so far. 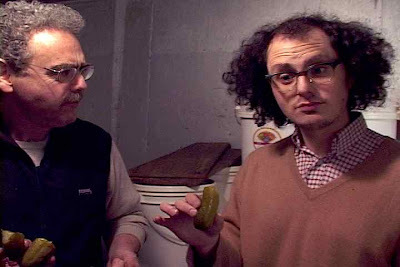 Food critic Barry Lazar and klezmer/hip-hop star Josh "Socalled" Dolgin analyze pickles in Simcha's walk-in fridge. 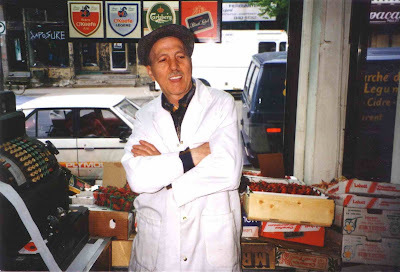 At the heart of Montreal’s St. Laurent Blvd., one of Canada’s most renowned and culturally rich urban thoroughfares, lies Simcha’s Grocery. 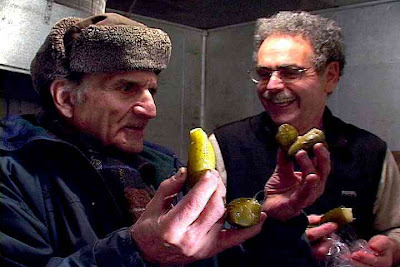 A month after the death of owner Simcha Leibovich, a motley group of his customers return to the legendary institution to reminisce about the enigmatic entrepreneur and eat his last batch of famous homemade pickles. A tasty and irreverent romp through one of the last old-style businesses on “The Main”. Featuring: klezmer/hip-hop wunderkind Josh “Socalled” Dolgin, the legendary, now deceased Montreal sculptor Stanley Lewis, food critic Barry Lazar and many more devoted customers of Simcha’s. Above: Listen to the track "Mourner's Kaddish" custom-created for the film by Socalled with vocals by Giovanni "Subtitle" Marks. "To err is human, but to ez... now that's something worth paying attention to"
- aspiring business mensch and #1 best selling author of "Ef the world". Look for it at your local bookstore or e-tailer in Spring 2018. Thanks for this flattering (faultering?) quote! Good luck with your book and thanks for checking out Ez Sez. Awww..if I'd a known there woulda been pickles afterwards I mighta come to the screening - although I do dislike crowds and heard it was sold out. So, Mazel tov! I thought of you today becasue I walked into Casa Minhota and Darcy remembered me and showed me their new dining room, which is right where Simcha's walk-in fridge was!!! You have more pickles? Hi, Spanky. Thanks for this comment. The pickles we served were Putters. Tasty, but no Simcha's pickles for sure. Screening went great. Sold out, lots of laughs, pickle fress-fest afterwards. I've been to the new back room at Minhota resto. Quite a difference from when Simcha's fridge used to occupy it.